Find out the answers to some of the most common questions we are asked. If you can’t find what you are looking for, please contact us and we’ll be pleased to help. Who can get a car loan? Please complete an online application and your personal broker will be in touch to arrange pre-approval over the phone. The next step is to collect your basic documentation and then we work on your behalf to get you the best deal possible from our panel of lenders. Approval usually takes between 24 – 48 hours, with settlement occurring shortly after. As a broker, it is our job to find you the best possible deal based on your current circumstances. This means we don’t have any set interest rates. Repayments will be dependent on your personal situation and criteria of the lender best suited to you. We will always get you the best interest rate possible. All finance approvals are subject to the client signing the loan contract. How do I check my check credit rating/score? Zoom Car Loans are able to view and assess your credit file, without making any additional enquiries. If you would like an obligation free copy and assessment of your credit file, to help with your loan application please contact us. Can you help me if I’m bankrupt or in a Part 9 debt agreement? No. Due to regulatory conditions, we are unable to assist if you are currently bankrupt or under a Part 9 Debt Agreement. As soon as this is discharged, our team of car loan experts would be more than happy to help. Do I need to be working to apply? No. You do not need to be working, however our lenders do require a minimum of income of $400 per week. This could be received via a Centrelink payment or another source of income. I’m receiving Centrelink, can I get a loan? Yes. We work with multiple lenders who can assist Centrelink applicants. Their minimum criteria is that you receive a minimum income of $800 per fortnight or $400 per week. This figure should be calculated before any deductions are removed from your payments. Unfortunately we are unable to accept applicants solely receiving Newstart or Youth Allowance benefits. I am pre-approved, what does that mean? A pre-approval means that based on the information you have provided us with, everything is looking great. However, we still need to submit your applications to the lender most suited to you, so they can complete their assessment before we receive the outcome. Our streamlined application process means the assessment period usually takes between 24-48 hours. Your broker will keep you updated every step of the way, right through to settlement. Do I receive the money into my account? Do Zoom Car Loans help ABN holders? Yes. The name might be Zoom Car Loans; however, we have finance solutions for all business structures. This includes finance for vehicles, equipment, machinery, tools or even a fleet of trucks if that’s what you need! No. You do not need a deposit to apply for a loan with Zoom Car Loans. We work with many lenders Australia wide so that we can offer 100% finance options. I am receiving Newstart / Youth Allowance benefits. Can I get a car loan? If you are applying for a loan by yourself and only receive Newstart or Youth Allowance benefits as your sole form of income, unfortunately you will not be eligible for a car loan. This is because you do not meet the minimum income requirement of $800 per fortnight, as set by our panel of over 30 bank and non-bank lenders. If you receive additional income, Centrelink benefits or have a partner or family member who is willing to join your loan application, we may be able to assist you. Please contact us to discuss your options. What are the benefits of using Zoom Car Loans? The answer is simple. We will get you the best deal possible on your next purchase. Rather than applying through your bank or to an individual lender, when you apply with Zoom Car Loans, you aren’t making a single application. In fact, you are making an obligation free enquiry with over 30 bank and non-bank lenders that we work with Australia wide. Our streamlined application process is simple, completely obligation free and settlement usually occurs within 24 – 48 hours of receiving approval. Our team of personal and commercial brokers work on your behalf, when and where you need them. Where are Zoom Car Loans located? 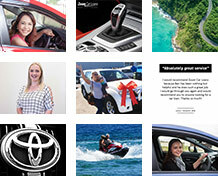 The Zoom Car Loans head office is in Palm Beach on the Gold Coast, however our team services Australia wide. You can reach us via phone, email, Facebook, fax, mail or in person. Our 3 step application process means you can drive away sooner. Backed by technology unique to Zoom Car Loans, we can usually process your application within 24 – 48 hours. Apply online in under 2 minutes. We will then asses your application and give you a quick call to arrange pre-approval over the phone. After you receive your pre-approval, we work on your behalf to find you the best deal possible from one of over 30 lenders Australia wide. Once we do, we will send you the paperwork to finalise the application process. Once you’re approved, drive away happy! Good news! The lender notifies us you have been approved for the loan and within 24-48 hours the money is transferred directly to the dealership or private seller. This is called settlement and at this point, you drive away in your new vehicle.